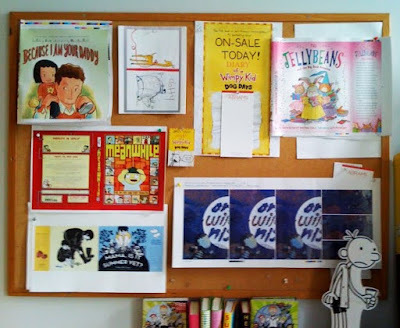 This month bulletin board features Because I am Your Daddy the follow-up to Because You Are My Baby, cover sketches for DOTTY, Diary of a Wimpy Kid Newspaper Ad, Jellybeans and the Big Book Bonanza, Meanwhile, Mama Is It Summer Yet? and On a Windy Night. Since reading your blog and becoming a librarian I have really started to pay more attention to covers. You do a great job and again, I think it must be one of the coolest jobs ever! Yes!! I'm off the bulletin board!! Thanks Jana! It kinda is.